The site is 600 square meter land area which located in medium dense, semi detached, without any physical and building typology from one and another. 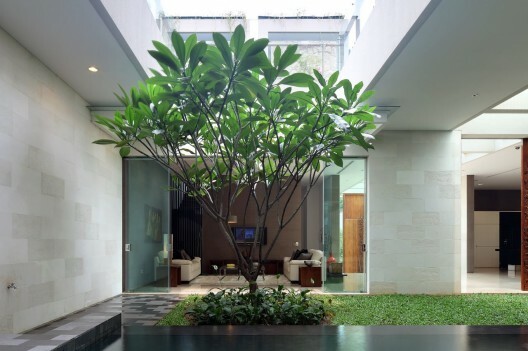 The client came to us with a particular vision of garden house, which can maximize a correlation to outdoor space from within. 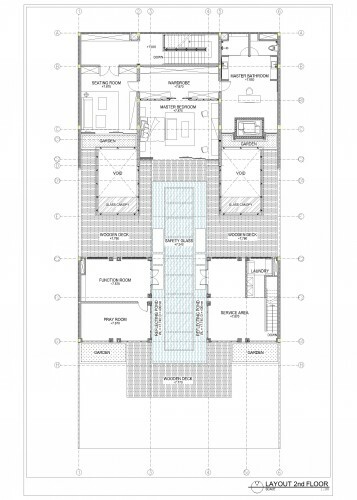 From client's brief of room program, come to quite huge area of 800 square meter, which should be located within limited site. In respond to limited site, compare to huge program. 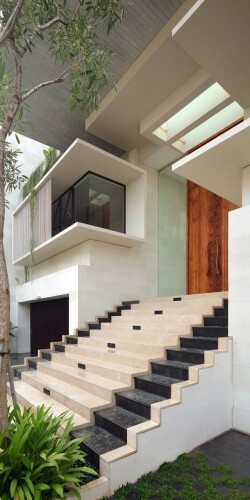 we try to elaborate and combine two courtyard spaces, which arranged vertically and super impose each other. 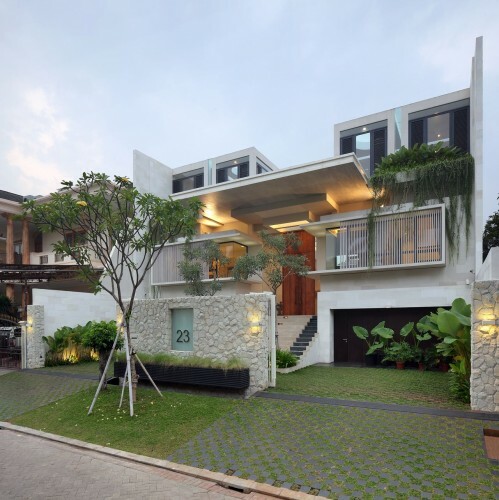 First courtyard was put on raised ground floor, which can be act also as a transition and buffer area from public space in front and rear, semi public, living room. Second courtyard located on the second floor, which will be act as intermediate outdoor space from master bedroom and surrounding neighborhood. 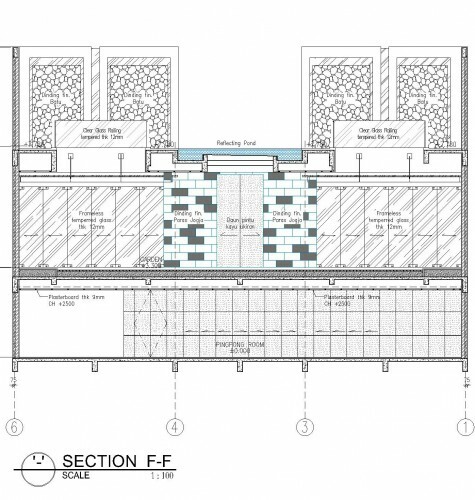 We decide to apply shallow reflecting pond within above courtyard and using glass as a base of it, to allow daylight penetrate the courtyard and room below. The shadow of moving water during daytime from reflecting pond, give a sense of nature inside the foyer room below. 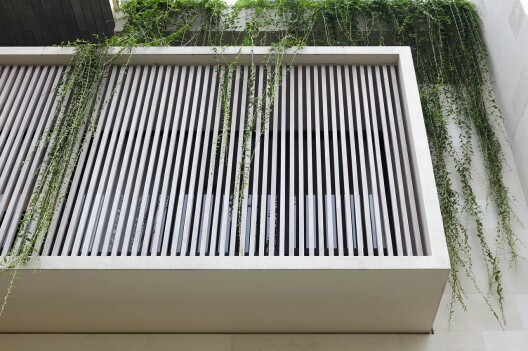 We also craft few voids / holes within second layer courtyard to give an access to daylight and air to room below. Swimming pool was located on the first courtyard, ground floor, according to the requirement zoning, and in the same time, act a daylight reflector to this outdoor space. The material used in this building has a light and bright, earthy color scheme to achieve a sense of natural, contemplative and serene living environment. Using a modern, simple and minimalistic style of furniture, we try to create a warm palette, combining with some ethnical and classic piece of decorative furniture and artwork. The marble floor in the public living and dining room act as a background for white leather sofa, combine with ligne rosset standing lamp, and modern glass stainless steel coffee table. The custom made, main entrance, wooden door was made by Kayun (wooden artist from Bali), designed with specific floral pattern, to reflect the courtyard inside. The dining table also made from one piece natural finished wooden slab, juxtapose with antique, decorative antique chinese cabinet set in front of the khaki, wall paper finish, background.